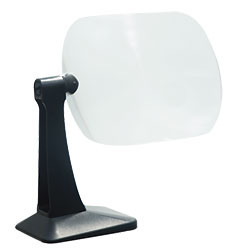 A hands free magnifying glass mounted onto a freestanding plastic frame. It offers 3x magnification and features a pivoting screen, allowing the user to position the lens as needed. Only one size and colour available. The large lens is mounted on to a one legged frame which incorporates a 360 degree swivel, allowing the lens to be angled in a variety of positions. Simply place the object that requires magnification under the lens. Adjust the lens position as needed, tilting the lens forward and backward.